Welcome to the website of the Petroleum Environmental Research Forum (PERF)*, a non-profit organization created in 1986 to provide a stimulus to and a forum for the collection, exchange, and analysis of research information relating to the development of technology for health, environment & safety, waste reduction and system security in the petroleum industry. Any company, partnership or individual engaged in the petroleum industry may apply to become a Member of the organization. Currently there are fourteen PERF member companies, including corporations from the US, Canada, Europe and Australia. Membership requires accepting the provisions of the PERF charter, paying a one-time initial fee, and paying a nominal yearly maintenance fee. Fees are used primarily for part-time legal counsel and other incidental expenses. Board members are expected to participate in monthly teleconferences, see that project updates are routinely completed, participate on proposal/idea scoping calls to insure alignment with PERF rules, and to the extent available within their respective companies, try to attend workshops and general meetings. It is also expected that hosting of general PERF meetings rotates among PERF member companies, and the prospective Board member should advocate within their organization for hosting these. Typically, the opportunity to host will arise every 3-5 years. The following member company representatives have been elected to serve for the current term and legal counsel has been retained. The PERF charter describe the status, the functioning and the goals of the organization. The charter outlines the rules under which PERF operates addressing: members, board of directors, funding, payment delinquency, meetings, legal counsel, and other topics. The Petroleum Environmental Research Forum (PERF)* is a research and development joint venture, formed to provide a stimulus to and a forum for the collection, exchange, and analysis of research information relating to the development of technology for health, environment & safety, waste reduction and system security in the petroleum industry. PERF is a non-profit organization of Members which are corporations engaged in the petroleum industry that recognize the importance of a clean, healthy environment and are committed to support cooperative research and development. PERF does not itself participate in research projects but provides a forum for Members to collect, exchange, and analyze research information relating to practical and theoretical science and technology concerning the petroleum industry, and a mechanism to establish joint research projects in that field. PERF Members have initiated or completed more than 100 such joint projects since its inception in 1986. PERF meetings have a decidedly multidisciplinary atmosphere, with attendance by scientists, engineers and managers with backgrounds in chemistry, chemical and environmental engineering, microbiology, and other fields. These professionals are guided by the technical challenge to address pollution prevention and safety, as well as a personal concern for the environment. 2) What are PERF’s objectives? To provide a stimulus for cooperative research and development of technology for the environment, health, safety, waste reduction and system integrity for the petroleum industry. To provide a forum to discuss and develop proposals for cooperatively funded projects relating to these areas. 3) How is the organization structured? The chair, vice-chair, secretary, and treasurer perform those functions necesseray for management of the organization. The officers serve without compensation from PERF. The officers and most recent past chair, with three other elected representatives from the membership, comprise the Board of Directors, which provides guidance to ensure that the organization achieves its purpose and objectives. 4) How does PERF operate? PERF has no staff nor office. PERF membership meetings are hosted by Members on a rotation basis and held every 3-4 months. 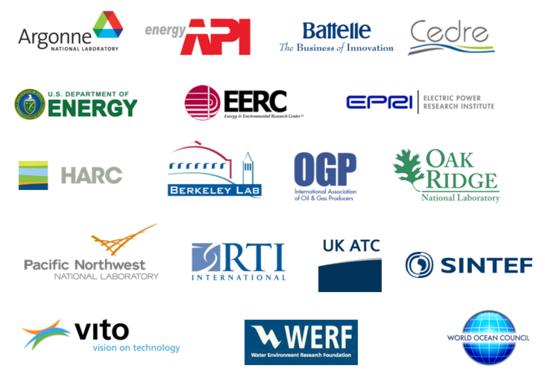 As part of an effort to improve coordination in R&D between industry and government, PERF frequently invites representatives of trade associations and government agencies such as DOE or the national labs to attend PERF meetings. At PERF meetings, Members propose specific research projects and invite other Members to participate. Research proposals are often prepared in small subgroups or topic discussion groups that meet on a periodic basis. Typically, a successful PERF proposal results in a project with six to ten participants. However, projects can proceed with as few as two or three companies participating. The actual research work may be performed by a university, an independent contractor, or by a PERF Member. In recent years, there have been a number of multiyear projects (or “Programs”) based on sharing of in-house R&D results and other similar contributions. PERF Programs generally encompass a set of projects in a specific focus area and often involve partnerships or coordination with trade associations and governmental agencies. PERF project results are usually confidential to paying participants for a limited period, as this provides an incentive for joining. Each project is protected under the National Cooperative Research and Production Act by filing a descriptive Notification with the Justice Department and the FTC. This results in a notice appearing in the Federal Register which usually states that participation is open to non-PERF members. PERF Members are not required to join any specific PERF projects, but participate in only projects of interest to them. 5) What are the benefits of PERF? Benefits of PERF include the obvious ability to leverage funding by participating jointly with other interested petroleum companies in R&D projects. Other important benefits include the fact that through PERF it is possible to create a “critical mass” of technical expertise to achieve results faster and more creatively. Projects can be conducted that are larger in scope than feasible for individual firms. It is even possible to evaluate several alternative approaches simultaneously. PERF meetings serve as a forum to share information on environmental concerns and research with other petroleum companies. This is helpful to smaller companies which may not have as many resources as the large majors. Such information exchange is clearly in the public interest, particularly with respect to environmental and safety R&D. This leads to a more thorough understanding of the petroleum industry’s environmental problems and their solutions. 6) How can PERF be contacted? A frequent question is how companies or organizations can propose projects to PERF or promote services and products. Since PERF is a cooperative venture for research rather than purchasing, vendors of projects or services are generally not invited to attend meetings except when a specific research project is under consideration. It is the policy of PERF to discourage commercial promotions at meetings by non-members. Contacts relating to specific research proposals are most effective if directed to individual PERF Members companies, and not to PERF itself. If a Member company is interested, and joint R&D is desired, then the Member company will sponsor a proposal. In some instances, PERF will accept unsolicited proposals via mail and make these available at meetings for Members to consider. Electronic proposals, comments, or questions, may be sent to the current Chair, PERF Board Kate Martin. 7) What does it take to become a PERF member? Any company, partnership or individual engaged in the petroleum industry may apply to become a Member of the organization. Currently there are sixteen PERF member companies, including corporations from the US, Canada, Europe and Australia. Membership requires accepting the provisions of the Perf Charter, paying a one-time initial fee, and paying a nominal yearly maintenance fee. Fees are used primarily for part-time legal counsel and other incidental expenses. For more information, please email the current Chair, PERF Board Kate Martin. A forum for research leaders of PERF member companies that stewards progress of proposed programs. Leads and champions research projects to optimize water management in upstream operations. Strategic direction, guidance, and assistance to PERF members on emerging waste management issues.